and How does it compare to Digital Printing? Offset printing is the preferred method of printing by Avanti Printing, and most other commercial printers, because it produces the highest quality printing possible. 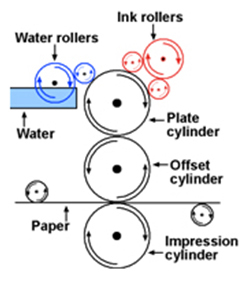 When you hear the term Offset Printing this refers to a technique of printing that has been around since 1903. I won’t bore you with the history of offset printing but it is interesting to note that the technology of the process really hasn’t changed much over the past 100 years. Although advances in technology have simplified the process and highly increased the quality. The technique can be described whereby ink is spread onto a metal plate that has been etched according to the image file. The ink is then transferred onto a rubber blanket and finally applied to the paper. The rubber blanket presses firmly into the grooves of the paper resulting in a very high image quality. So you may ask yourself, how does this process compare to Digital Printing and how do I know which process to ask for when placing an order with Avanti Printing? There are many factors that would decide which process to use, but the most simple common factor is quantity. Other benefits of Offset Printing are listed below. 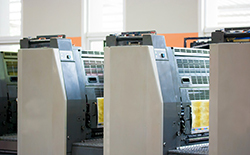 Although Offset printing set-up costs are relatively high, once the quantity increases past a certain point (usually 1,000 pieces) it is much cheaper per piece than Digital Printing. Since there are no setup costs involved with Digital Printing, small quantities can be done very cheaply when compared to Offset. Typically the runs are under 1,000 pieces of regular 8.5×11 sheet size. Offset Printing can be printed as 1, 2, 3 or 4 color. For more information see link below. What is 4 color or Full Color printing?